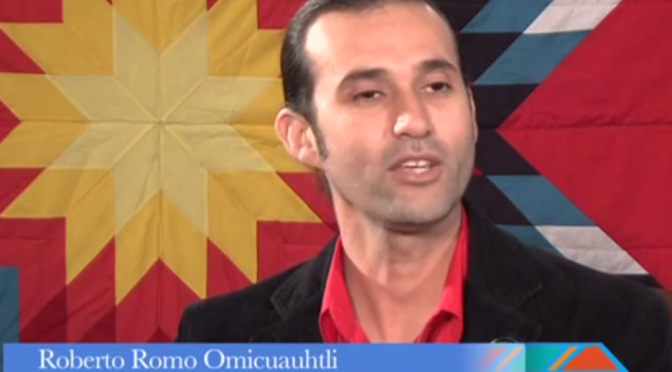 Cihuapilli Rose Amador LeBeau interviews Roberto Romo Lopez (Omicuauhtli, Mexica) teacher of School of Arts and Culture at Mexican Heritage Plaza on Native Voice TV. Romo currently teaches two classes and mentions what each of his classes are and how it helps children (ages 5-15 years old) learn their tradition and culture, self realization and how to connect with the all age groups, especially the ‘Elders‘. NVTV gives Romo an opportunity to show his current artwork and he explains them in detail (four art pieces). This in itself is fascinating and educational. Please take the time to watch this show and visit Romo’s website at http://www.RobertoRomo.net for more information.